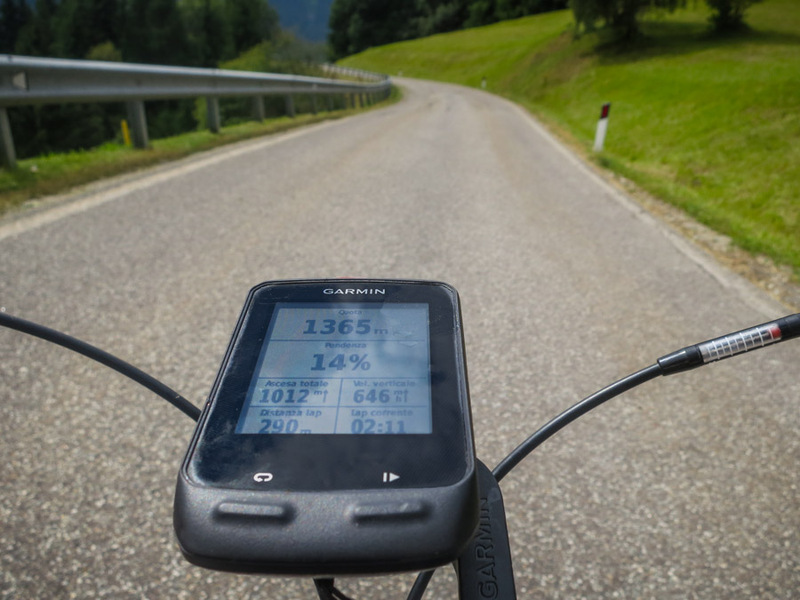 Passo Furcia is one of those climbs that you will ride once and then wait a long time before riding it again. Both sides of the Furcia are damn hard, with double-digit gradients where it’s really hard to find a nice cycling pace up to the top. The climb starts in Valdaora with an easy climb towards the town of Gassl. 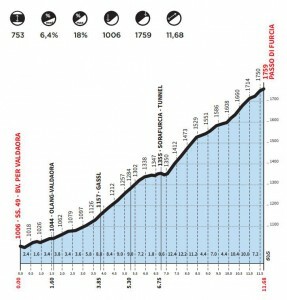 The real climb starts here, and the 8.4 km left to the top have an average grade of 8%. 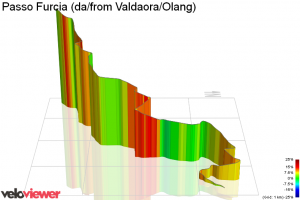 Already at the beginning, you’ll have a 9 to 10% grade in the climb, with the first 3 hairpins that take you towards the little town of Sorafurcia (Ladin) also called Geiselsberg in German. In this town you’ll find a water fountain to fill your bidons before things get serious. If you look south from the water fountain, you can see the road going downhill into a short tunnel. If you look through the tunnel, you might see the road on the other side of the hill. From this viewpoint, the road looks steep and, yes, it is! Better build up some speed on the short downhill so you don’t need to push out of the saddle from the start on the up . The gradient throughout here is 12%, touching a 15% grade at the end of the straight before a nice hairpin saves you and you can start zig-zagging up the road. From this hairpin, the gradient continues on over 12% and you’ll go on for one more km before you come to a flat. The hardest seems to be over, if weren’t for your GPS device that shows little portions with grades over 10%! 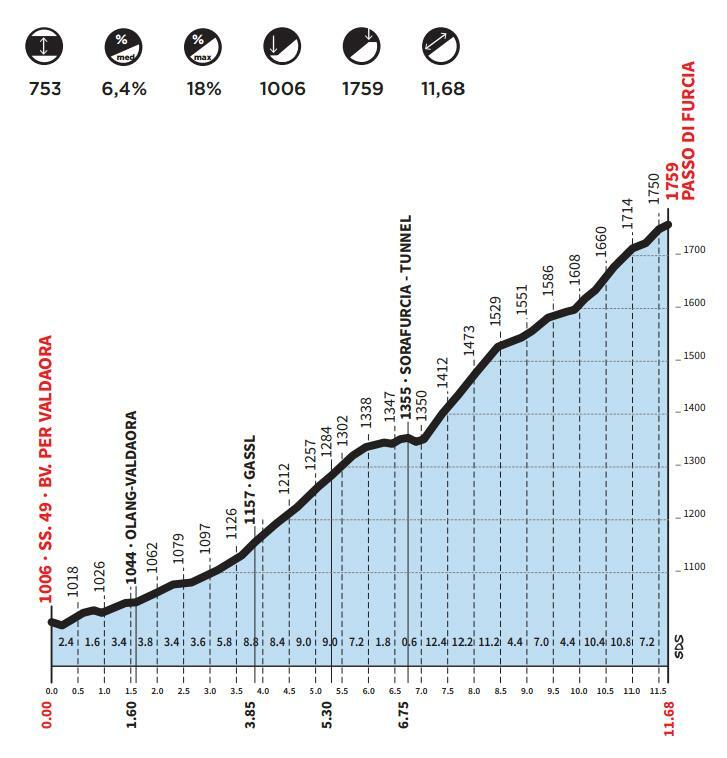 But this is just on the final 2 km, then you’ll suddenly find yourself in front of the Passo Furcia sign. From Passo Furcia the roads continues to Plan de Corones / Kronplatz where the Giro d’Italia finished twice with a Time Trial starting from San Vigilio di Marebbe.